Je ne connaissais pas The Goddess Tarot de Kriss Waldherr, jusqu’à ce que je lise ce billet de Sofiah. Je suis donc moi aussi allée balader mon mulot du côté du tirage en ligne pour une question relationnelle. Quel avenir pour ma relation à F. ? Gwenhwyfar, the Welsh first lady of the islands and sea is believed to have existed as long as there was surf to pound against rocky shore. 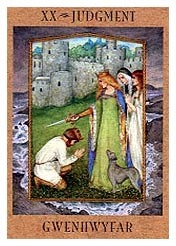 Praised for her judgment and wisdom, it was believed that no man could rule Wales without her by his side. Important decisions or news. Movement into the next phase of life. Time for a major and necessary change in life—often welcome, but frightening because of its magnitude. Cumulation of a creative venture. Success that becomes overwhelming with its responsibility. Your final vision is within reach, but work can be oppressive. 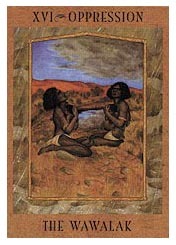 During the Dreamtime, the Australian aboriginal sister goddesses, the Wawalak, were swallowed whole by Yurlungur, the Great Rainbow Serpent. Oppressed by darkness in the belly of the serpent, the Wawalak wept until they were reborn from Yurlungur back into the light. Feeling overwhelmed or oppressed by circumstances or emotions. Depression. A new start after a painful ending that may have shattered your view of the world. 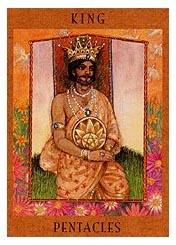 The suit of pentacles is associated with Lakshmi, the Hindu goddess of fortune and prosperity. Pentacles, as gold and shiny as the sparkling jewels Lakshmi is so fond of, symbolize the riches contained within the earth. 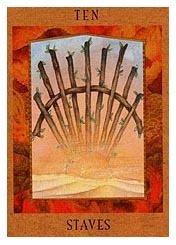 The suit of pentacles can be thought of as the grand harvest that arrives after we master the lessons of the previous three suits. Pentacles tell the story of the bounty of the earth—so often symbolized in many cultures as a generous earth goddess. Lakshmi, the Hindu personification of this fertile, prosperous, and distinctly feminine force, is honored to this day for these very qualities. The forces of worldly prosperity. The ability to create wealth. Real estate transactions. Investments—money or emotional. Steadfastness. Someone who personifies these forces. Cette entrée a été publiée dans Oracles et Tarots et étiqueté Kriss Waldherr, The Goddess Tarot . Marquer le permalien .